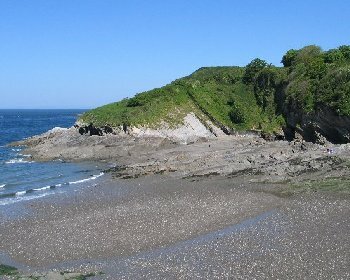 Hele Bay is a small cove on the edge of Ilfracombe. The beach is sand with lots of rock pools and there is easy access to the beach. Signs warn of rip currents, a risk of getting cut off at high tide, falling rocks and steeply shelving beach at high tide. Also not to use inflatables. See Beach Safety Guide. Short slipway to the beach which is suitable for wheel chairs. The car park is several minutes walk from the beach. Hele Bay is close to Ilfracombe which is 45 miles from Bude and 52 miles from Exeter. There are various routes into North Devon. From North Cornwall take the A39 (North Atlantic Highway) past Bude and into North Devon towards Barnstaple. Alternatively from Exeter take the A377 to Barnstaple. At Barnstaple follow the A361 over the new road bridge over the River Taw and then at the Braunton Road Junction turn left for Ilfracombe. Follow the A361 to Ilfracombe and into Ilfracombe and continue on this road (which becomes the A399) to Hele Bay. 1 car park several minutes walk from the beach.